Packers and Movers Charges, Packers Movers Rates & Costs Approx. Hello folks, you want to understand approximate packers and movers charges for home shifting, office shifting and car transportation. Your concern is right because without knowing estimated shifting cost you cannot plan your move properly at your preferred budget. It becomes imperative to make budget for a move because moving from one place to another can be an expensive affair too. So, it would be a wise decision to understand different cost heads and factors which define overall relocation cost. There are so many myths and questions on how professional movers and packers companies calculate rates and charges for their home shifting, office shifting and car transportation services. Some of the most common questions and queries we often get by our site users are following? What is the charge of packers and movers? What is the cost of a local shifting in a city? What is the cost from one city to another? Which is the cheapest moving company to hire shifting services? What is the car transportation cost from one city to another? What is the bike shipping charge? There are several other questions about moving charges and relocation cost people often ask with us. Answering these questions is a difficult task because how one can tell the actual cost of moving home or office without analyzing the circumstance of relocation and belongings which need to be packed and moved. In fact, customers can get precise moving estimates only after once the packers and movers have finished the pre-move survey. When it comes to find the movers at affordable rates it is advisable that customers must collect free estimates from at least top 5 best packers and movers companies so that they can analyze and compare different price quotes and make decision right to select the best service at preferred budget. What Factors Affect Rates & Charges of Packers and Movers for Shifting Services? There are various factors and different cost heads on which professional packers and movers companies calculate overall shifting cost and provide precise estimates to their customers after conducting the pre-move survey and analyzing items for moving. Main factors that affects moving charges and price can be volume of goods, size of move, distance between destination A & destination B, difficulties level, circumstance, time taken, manpower required, special requirements, and add-on services. For a local shifting distance does not matter lots. The volume of goods is important that can affect the cost. For example, if you are moving with few household items then you can shift to your new place with the cost of approx. Rs 3,000 to Rs 8,000. The cost may vary on the basis of size of move and volume of goods. You will have to pay different cost for items of different sizes of home shifting such as 1 BHK, 2 BHK, 3 BHK, 4 BHK, 5 BHK or Villa. But in case of distance also matters. The price may vary upon distance between two cities and size of move as well. For local shifting, generally packers and movers companies charge approx. Rs 1,000 to Rs 3,000 as transportation charge, and Rs 2,000 to Rs 5,000 as handling charges which include packing, loading & unloading of goods. Many companies don’t charge for unpacking service but some companies may charge additional cost for their unpacking services. So, customers must make clear about it before finalizing the household shifting services of any moving company. Cost of packing materials and boxes used. Handling charge that includes loading & unloading of goods. Transportation charge depends on vehicle type and distance. Charges for add-on services on specific demands. Warehousing and storage cost, optional. Applicable taxes such as state tax, toll tax & service tax. The packers and movers charges in India may also vary company to company because they may have their own different parameters to calculate overall shifting charges and provide estimates to their prospective clients. How to Reduce Packers and Movers Charges and Save Money? To save money on packers and movers rates in India you must collect free estimates from at least top 5 best matching companies. You should compare the estimates including price and services as well. Thereafter take the decision right to choose the one that suits your specific needs perfectly at your preferred budget. Still, if you think the movers and packers charges are too much or beyond your budget then there can be several ways by which you can minimize the overall moving and shifting cost. The first thing we recommend to you getting rid of junk items and old belongings which you don’t use or don’t want to use in future. The less items you will have the less you will have to pay. It works because the volume of goods is one of the main factors that affect the moving cost and rates. Arrange a garage sale for the old belonging which you don’t want to transfer to your new place. This will help you earn some extra cash which you can adjust in moving cost. 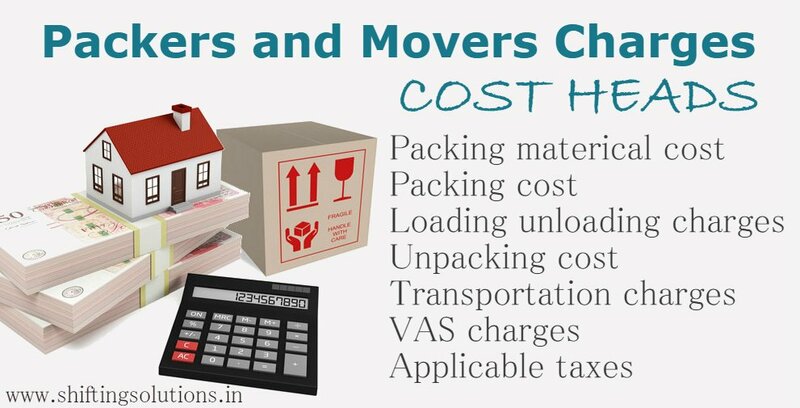 Packing cost is one of the primary cost heads for movers and packers charges in India. If you can pack your items on your own then pack. By doing so you can save a significant amount of money. You can also save money of packing material cost by gathering used boxes and packing materials from your local grocery store or chemist. If they cannot provide you free of cost then can certainly give you at very cheap price. DIY moving method will be a money-saving moving option but make sure you can pack and do some tasks of your move perfectly like professionals can do. If you are not sure how to pack things correctly then it would be better to let movers and packers do the task to avoid the risk of damages. For Standard Rates & Quick Estimations, Get in Touch Today!